The old year is practically over, but there's a whole new year ahead. Something you can do as a family in 2016 is explore the multitude of historic offerings we have in our area. One place to visit is the USS Constitution, also known as "Old Ironsides." The Constitution is over 200 years old, and, is still capable of being sailed! It is docked at the Charlestown Navy Yard, just north of Boston. One of the great things about the Constitution Museum is that it is admission by donation! So those with several children in tow will not have to face bankruptcy to go! There's been a special exhibit of model ships at the museum that has been extended until March to allow you more of an opportunity to visit "Masters of Miniature." The USS Constitution Model Shipwright Guild and the USS Constitution Museum present Masters of Miniature: The 37th Annual Model Ship Show. Exquisite ship models will be on display along with marine paintings by members of the American Society of Marine Artists. With over 50 handcrafted models of all sizes, types, and materials, you can explore the intricate art of model making as practiced today. To read more about the USS Constitution, look for A Personal Tour of Old Ironsides by Robert Young [J 359.3 YOU]. The Library is closing today at noon and will be closed tomorrow, New Year's Day. We will be open regular weekend hours. Have a safe and happy holiday! 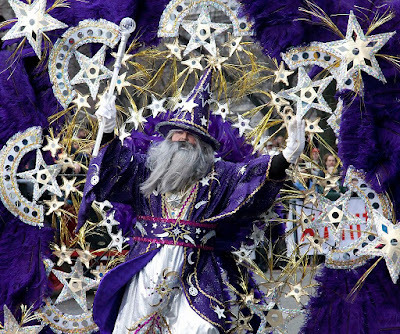 Many cultures, and families, have New Year's traditions. What's yours? Some are as simple as leaving the front door open to welcome good luck. Others involve preparation of special meals. Still others involve religious observations. To learn about meals created for New Year's, look in Holidays of the World Cookbook For Students by Lois Sinaiko Webb [641.568 WEB], or The World Religions Cookbook by Arno Schmidt and Paul Fieldhouse [641.59 SCH]. Within these cookbooks you'll find recipes for Osechi-Ryori (New Year's food) from Japan including O-zoni (New Year's soup), Kateh (golden rice cake) from Iran, Hagmanay bun (New Year's bun) from Scotland, and Bigos (Hunter's stew) from Poland. You'll find plenty more recipes and traditions covered in cookbooks from individual countries. Come browse our shelves then have a Happy New Year! Photo of Philadelphia's New Year's Mummer's parade by Carol M. Highsmith, Courtesy Library of Congress. Christmas Break--Are You Ready to Break? You need something to do with the kids before they drive you crazy, right? Here's where the Library comes in. You're familiar with our collections of DVDs and musical CDs, but did you also know we have children's books on CD? Everything from A. A. Milne's When We Were Very Young & Now We Are Six [J AB/CD MIL] to Newbery Award winners such as Walk Two Moons by Sharon Creech [J AB/CD CRE]. We have children's magazines like Ladybug [J MAG CRI] and Sports Illustrated for Kids [J MAG SPO]. And you know about our museum passes, right? If not, click here to get started. We have a pass to the Children's Museum of New Hampshire, the McAuliffe-Shepard Discover Center, and others with kid appeal. Being a cat owner, I'm not sure that it's worth this classical musician's time to try to think like a cat. Every time you believe you know what's going on in your cat's brain, she'll do the complete opposite. Maybe cats are psychic and are just out to get you? Or maybe...cats are ALIENS? If you believe those who post videos on YouTube, that's exactly what they are. I typed in "cats are aliens" into the search box and got more than a dozen pages of results! And, in our collection we have at least two cat vs. aliens books (Mr. Wuffles! by David Wiesner [JP WIE] and Binky the Space Cat by Ashley Spires [J CX SPI], but none on cat aliens. What's up with that? 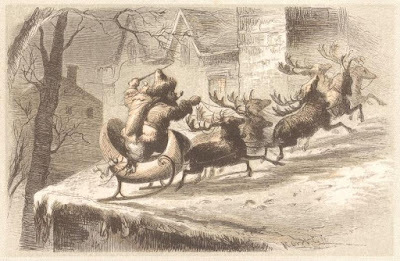 Here are a few illustrations from old editions of Clement C. Moore's classic poem, The Night before Christmas (also known as A Visit from St. Nicholas). James G. Gregory, publisher, 1862. 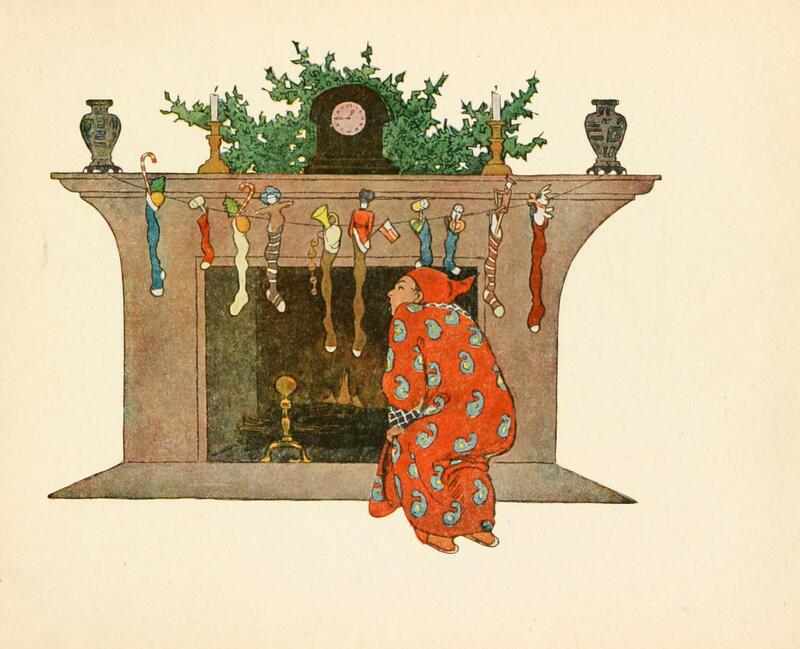 Illustrations from drawings by F. O. C. Darley. 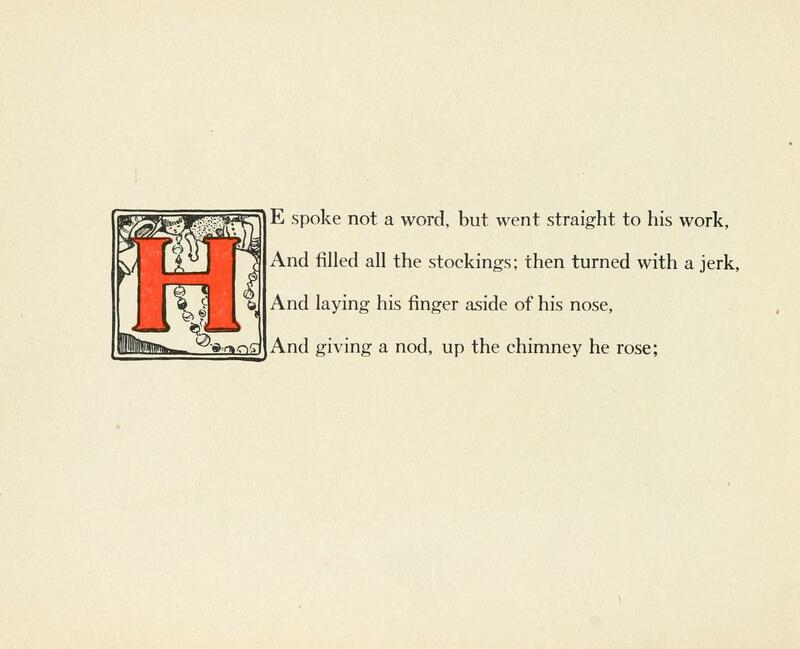 Houghton Mifflin publisher, 1912. 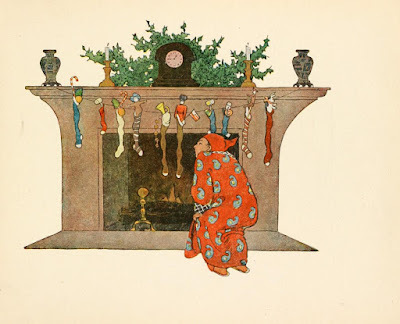 Illustrations by Jessie Willcox Smith. The Atlantic Monthly Press publisher, 1921. The Poetry Friday Round-Up is being held at Live Your Poem. The Library will be open again for business Saturday at 9:00 AM. 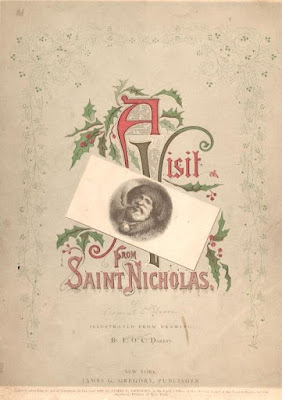 On NPR Saturday morning, Scott Simon read a letter Mark Twain wrote (as Santa) to his young daughter Susy. It is included here for you to enjoy! To read more about Twain and his children, look for The Autobiography of Mark Twain (in three volumes, we have one and two [B TWA]. Volume three was recently released and should be arriving soon. The Library closes today at noon and will reopen on Saturday at 9:00 AM for regular weekend hours. Have a safe and happy Christmas! 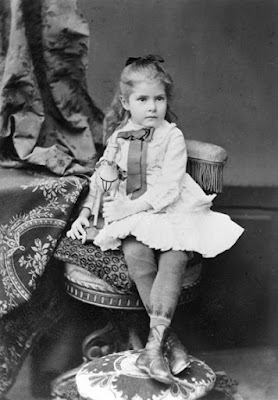 Photo of Susy Clemens courtesy the Mark Twain House & Museum, Hartford, CT.
For those who have now grown up (in other words, everyone reading this), there are always memories from holidays that stick with one long into old age. Some people are lucky enough to be able write them down to share with others. Think Truman Capote's "A Christmas Memory" found in Breakfast at Tiffany's and Three Stories [F CAP, also in DVD CHR], or Jean Shepherd's memories that were turned into the classic movie, A Christmas Story [DVD CHR]. 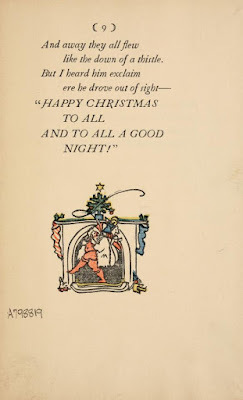 I hope your memories of this Christmas inspire you for many years to come! Today is the Winter Solstice--the shortest day and the longest night of the year. National Geographic has information and history of the Winter Solstice here. Christmas Eve will see an asteroid zipping by our planet, and on Christmas Day, we'll be experiencing a full moon. NASA tells us a Christmas full moon will not happen again until 2034! Easy Reader version. Adapted by Kristen L. Depken [E DEP]. Original author version by Robert L. May. We own several illustrated versions, all found under [JP MAY]. There is also, by the same author, Rudolph Shines Again [JP MAY], Rudolph's Second Christmas [JP MAY]. Song version. The most famous is probably by Gene Autry, which is found on The Ultimate Christmas Album [CD HOLIDAY ULT]. The Burl Ives version, from the video is found on Songs from the Christmas Classics: Rudolph the Red-Nosed Reindeer ; Frosty the Snowman ; Santa Claus Is Comin' to Town; The Little Drummer Boy; and, Frosty Returns [CD CHILDREN SON]. There are many more versions found on additional holiday CDs by Bing Crosby, Perry Como, Harry Connick, Jr., Raffi, Phil Spector, etc. Don't forget that you and your little ones can track Santa's sleigh as it travels across the world, courtesy of NORAD. I have a writer friend who works for the MSU extension service in Mississippi. She wrote the script for this video, and, it is rumored that she also plays an elf! Well, it's the final days for Christmas gift-shopping. Cut down on your shopping by just going to the grocery store. There you can purchase Mason jars, some beans, flour, spices and you've got a bunch of hostess gifts or stocking stuffers. On your way to the supermarket, stop by the Library and look for one of these to direct you in purchasing correct proportions! Kurious Kitty is taking the day off to host the Poetry Friday Round-Up at Random Noodling. Please stop by! Some days all you want to do is share animal videos. Today's that day! Who isn't intrigued by a pink bird? Here's a whole flock of them dancing up a storm! I'm surprised that there are so many books in our collection about flamingos! Most, however, are fantastical children's books like, Miss Mingo and the First Day of School by Jamie Harper [JP HAR], Sylvie by Jennifer Gorton Sattler [JP SAT], or Flora and the Flamingo by Molly Schaar Idle [JP IDL]. I must say, my knowledge of the mechanics of music is limited at best. When someone says a song in a minor key, I go, "huh?" I don't know about you, but I think if the tempo of the minor key version were speeded up somewhat, then the song would lose much of its creepiness. What do you think? 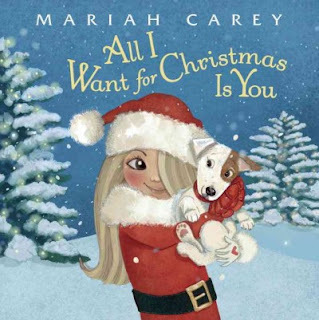 Many people love the original version, and, we have it available in the movie Love Actually [DVD LOV] and on Mariah Carey's Merry Christmas and Merry Christmas II You albums [both CD HOLIDAY CAR]. New this year is a picture book version illustrated by Colleen Madden [JP CAR]. Last week The Huffington Post published an article titled, "These Are The Best Movies To Watch When You Need An Ugly Cry." We own most of the titles on the list, if you need an emotional release this holiday season. Enchanted April. [DVD ENC] A movie with strong female characters, a lovely story line, and was filmed in a gorgeous location. What's not to like about a "tub of love"? The Holiday. [DVD HOL] I know, I know, it stars Jack Black, however, he plays a character one can't help but liking! Please note: our copy has gone missing, so I will be reordering it! Several other GMILCS libraries also own it. The King of Masks. 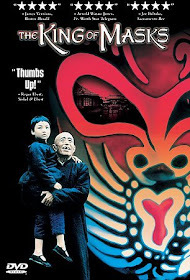 [DVD KIN] Don't be turned off by the fact that the film is subtitled. It is well worth watching and is poignant, rather than melodramatic. Love Actually. 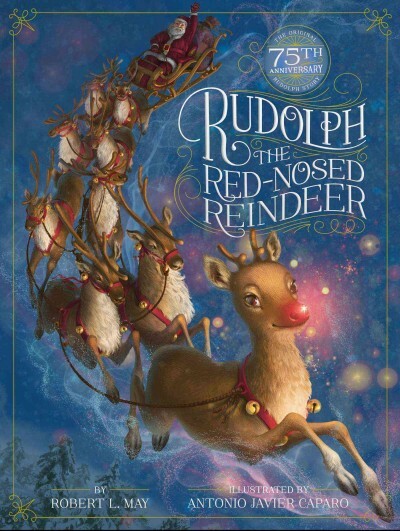 [DVD LOV] This is my all-time favorite Christmas movie! The opening and ending scenes, which filmed real people at the arrivals terminal at Heathrow, always make me weep. Room With a View. [DVD ROO] A simple love story that always makes me happy, and a bit weepy. It's based on the book by E. M. Forster, and is the best adaptation of a film that I've come across. I have plenty more tissue-worthy films to recommend if you're interested. It is sad to note that there are those who are unable to provide gifts for their kids during the holiday season. This is where Windham's Helping Hands comes in. 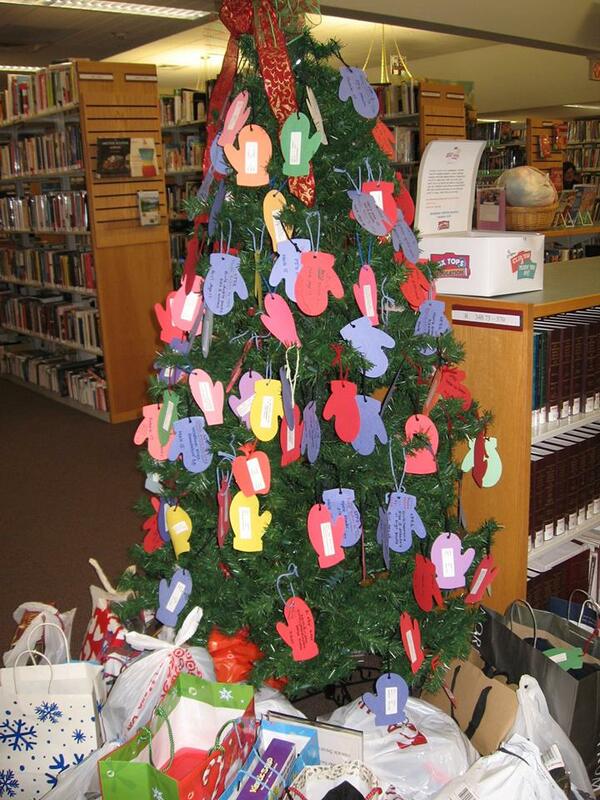 They place a tree with mittens in the Library each year. Each mitten represents one gift request for a child or teen. This year it seems that there are more requests than ever before. We kept putting out mittens, and more mittens, and even more mittens, remained to be hung on the tree! 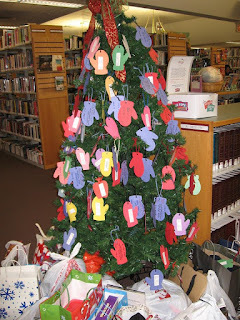 Today, all gifts must be returned to the Library, however, since there are mittens remaining, Helping Hands will have to send volunteers out to shop during the upcoming days. So, if you're feeling bad that you didn't get down to the library in time, please consider writing a check to Windham's Helping Hands so that the shoppers will have sufficient funds to make everyone's wishes come true. Many thanks to all who have donated gifts, and to all the Windham's Helping Hands volunteers! 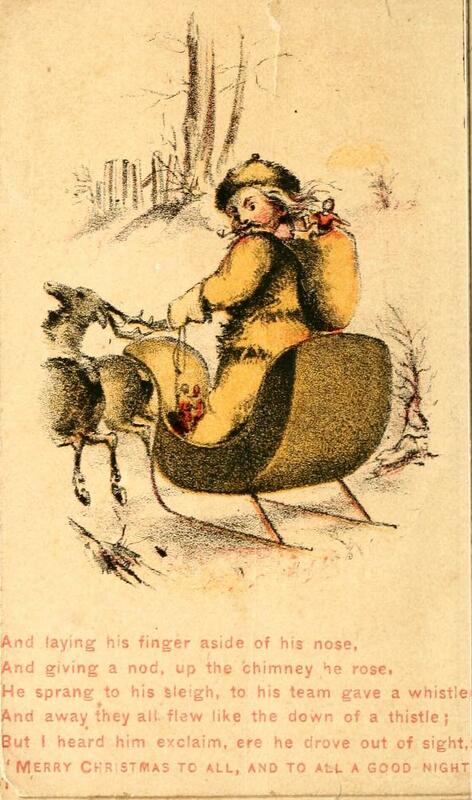 If you'd like to read a heart-warming Christmas gift story, look for The 13th Gift: A True Story of a Christmas Miracle by Joanne Huist Smith [394.2663 SMI], or, A Secret Gift: How One Man's Kindness--and a Trove of Letters--Revealed the Hidden History of the Great Depression by Ted Gup [977.162 GUP]. Lee Bennett Hopkins, is a poet with a Guinness World Record. 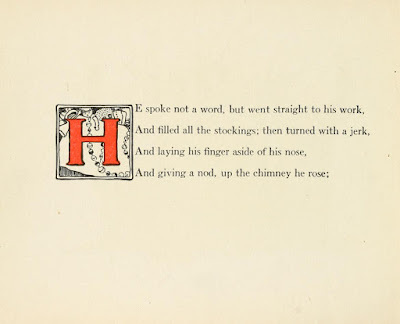 He is the "Most Prolific Anthologist of Poetry for Children." 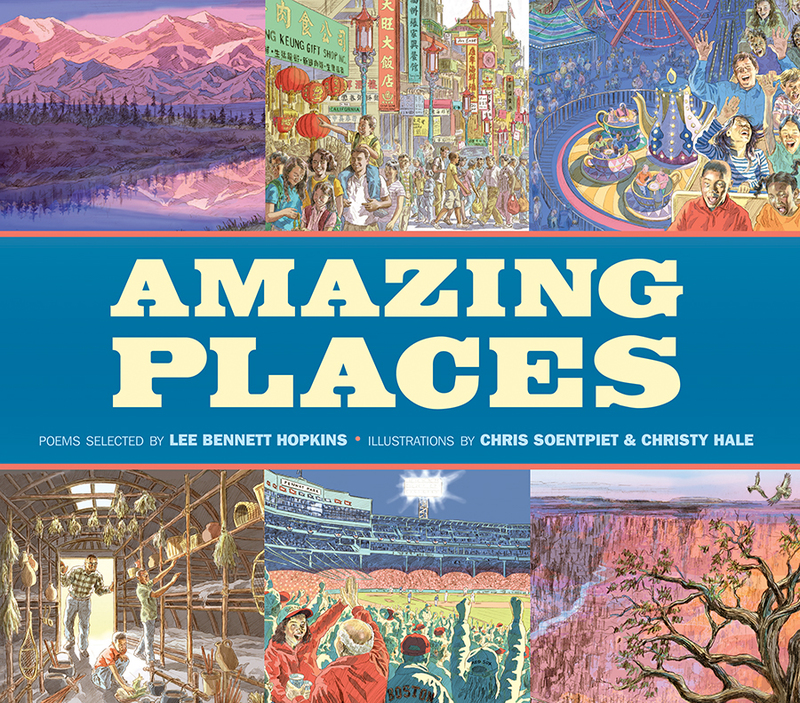 Mr. Hopkins recently published yet another anthology, this one, Amazing Places [J 811.008 AMA], contains poems of places and the things that made these places particularly notable. For example, there are poems about Niagara Falls, Fenway Park, Chinatown, and the Liberty Bell. 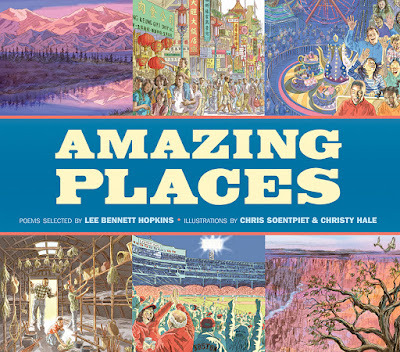 There is a map on the endpapers so that readers can place the locations, and, there are notes at the end of the book that tell us "More about the Amazing Places." A Teaching Life is the place to be today for the Poetry Friday Round-Up. As we move into winter, you may need to find something to occupy your kids on snowy days. Have you thought of tangrams? Tangrams are an old puzzle game that came to us by way of the China trade in the early 1800s. It consists of seven flat shapes--two large triangles, one medium triangle, two small triangles, one small square, and one small parallelogram. All seven shapes can be cut from one square. The shapes are called tans, and are put together to form a variety of recognizable other shapes such as people, animals, etc. You need not spend a lot of money on a tangram puzzle, although there are mahogany sets, magnetic sets, travel sets, etc. You can make your own tangrams out of paper or cardboard, instructions here. Or, if you're feeling adventurous, you can even make a puzzle out of a sandwich! Instructions here. Grandfather Tang's Story by Ann Tompert [JP TOM] is a picture book that incorporates tangram foxes. It would make a good introduction to tangrams for the younger child. Yes, crocheting is generally associated with grannies. Just think of the granny square afghan, and the various crocheted vests and ponchos those of us who lived in the 70s received from our grannies as homemade gifts. Despite the granny label, crochet can be fun and fashionable. Crochet something startling for yourself or a friend--maybe even for your grandkids! Oscar de la Renta crocheted dress photo courtesy Vogue.com. Not your ordinary spray-paint type--the defacing medium of choice for these vandals is yarn! Since scarves lend themselves to wrapping around things, if you want to take up yarn bombing, you may want to start with scarves. You'll find some great scarf patterns in Dress-To-Impress: Knitted Scarves by Pam Powers [746.432 POW] or It Girl Crochet: 23 Must-Have Accessories by Sharon Zientara [ebook] or any number of other crocheting books in our collection! Less than a month from now is the start of the last season of Downton Abbey. Season 6 begins on January 3. For diehard fans this is a long anticipated event, however, after the season ends in March, most fans will be left bereft. It's true. Yesterday, at the Red River Theatres in Concord, there was a preview screening of the first episode of season 6. Held in conjunction with NHPTV, there was tea, and the screening. Baines, Emily Ansara. The Unofficial Downton Abbey Cookbook: From Lady Mary's Crab Canapés to Mrs. Patmore's Christmas Pudding: More Than 150 Recipes from Upstairs and Downstairs. [641.5 BAI]. Believe it or not, that are even more! Search in our catalog under "Downton Abbey." 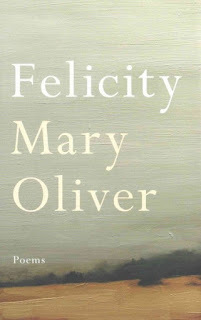 Reading Mary Oliver's newest book of poetry, Felicity [818.54 OLI] is like opening a bag of potato chips. You can't eat just one and before you know it, you've finished the whole bag. However, there is no guilt involved in reading every poem in this slim volume. Each one is a non-caloric treat that actually provides nourishment for the soul. Oliver has divided her collection into three chapters and has begun each chapter with quotes from the 13th-century Persian poet, Rumi. Here's one for the chapter titled, "Felicity": "Out beyond ideas of wrongdoing and rightdoing there is a field. I'll meet you there." In today's world, this is particularly resonant. 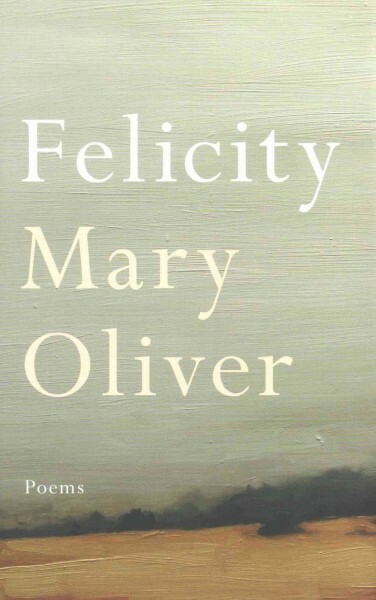 Felicity would make a great holiday gift or a stocking stuffer even for those who may not have read much poetry in the past. Oliver has a talent for saying things succinctly and making ideas accessible to the average reader. I'll meet you at Buffy's Blog for today's Poetry Friday Round-Up! This weekend is really the beginning of the "everything Christmas" festivities that happen each year in New England. Between the small church fairs and the gala Boston Ballet performance of the "Nutcracker," you'll find plenty of mid-range (by that I mean inexpensive) activities to engage in. 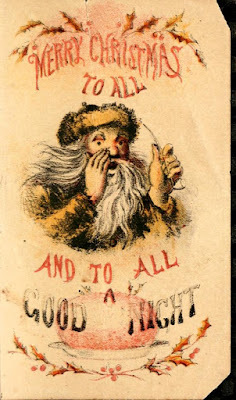 Yankee Magazine [MAG YAN] has assembled a list of New England holiday celebrations for you. Click here. One New Hampshire celebration is the Strawbery Banke Candlelight Stroll, now in its 36th year. I have attended in the past and can strongly recommend it! The last time I attended the Candlelight Stroll, in 2012, one of the attractions was a display of gingerbread. I won't exactly say they were gingerbread houses, since SpongeBob SquarePants does not live in a house, but let's just call it a display of gingerbread environments. Shown is a lobster shack. A portion of Bikini Bottom is visible on the right. The above titles are only a few of the gingerbread books we own. We also have a several gingerbread house how-to books and an interesting history book, too! The history book is Gingerbread for Liberty! 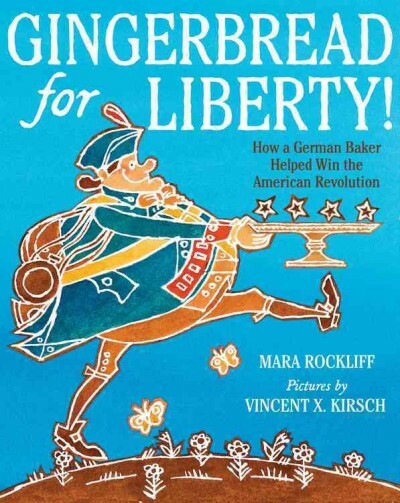 : How a German Baker Helped Win the American Revolution by Mara Rockliff [J 973.3 ROC]. 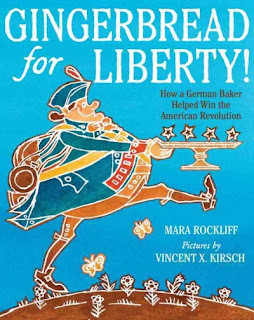 The publisher describes it as "A stirring picture book biography about a forgotten hero of the American Revolution who rose to the occasion and served his country, not with muskets or canons, but with gingerbread!" Last week Adele appeared on Jimmy Fallon's late night show and sang the single from her instantaeous-bestseller CD, 25. The performance was a little out of the ordinary in that the musical accompaniment was on children's instruments such as kazoo, banana shaker, and a tinny xylophone. It was great! 25 is currently on order, but while you wait, you can listen to Adele's earlier CDs, 19 and 21 [CD ROCK ADE]. Yesterday, we discussed the possibility of panic starting to set in. I suggested letting go of some of your expectations. Here's an example: this year you wanted to knit a sweater for your best friend. A hand-knit scarf takes a lot less time and your friend still has a handmade gift, knit with love. So why frustrate yourself? Relax, use some of that time you saved by reading a holiday book. 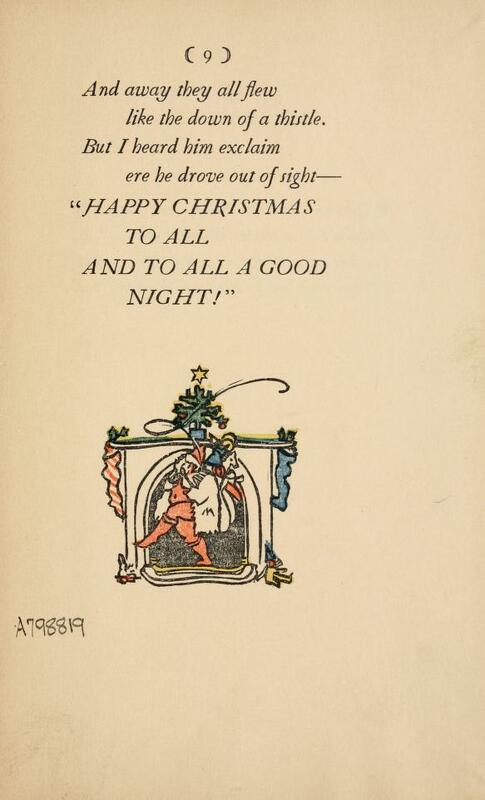 Each year publishers release short, often overly sentimental, Christmas novels by their bestselling writers. These books end up on the December bestsellers lists and we purchase them so that you don't have to!